The Reading Team was praised by the West Harlem Development Corporation as a group that used its grant wisely and was able to produce measurable results that would draw the interest of other grant-making organizations. 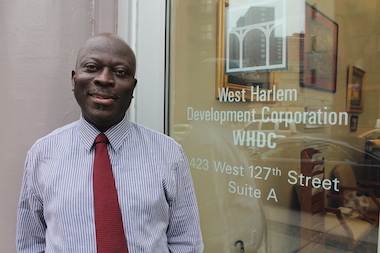 HARLEM — During its first grant-making period, the West Harlem Development Corporation was "intentionally liberal," Executive Director Kofi Boateng said. The group, charged with distributing $150 million in funds as part of a community benefits agreement with West Harlem for Columbia University's Manhattanville campus expansion, had spent more on consultants than grants and was investigated by state Attorney General Eric Schneiderman. "There was a lot of pressure from the community and the attorney general's office to get the money out," said Boateng, who gave out $2 million to 83 nonprofits in 2013. "We were intentionally liberal to see what would work and to help us develop a strategic focus." Kofi Boateng, executive director of the West Harlem Development Corporation, is credited with bringing stability to the group following an Attorney General investigation of its spending practices. The group is now focusing its grant-giving to target 13 strategic goals. A year and a half removed from state scrutiny, Boateng wants groups that are hoping to receive some of the $2 million in grants the agency will give out this year to know that those liberal days are over. The group has chosen 13 areas covering education, workforce development, health and affordable housing where it believes the money will produce the greatest results. Specific goals include improving the reading levels of elementary-school children, decreasing the higher-than-average unemployment rate among African-Americans and Latinos and preserving or funding 300 units of affordable housing. Boateng said he expects to have some "tough conversations" with "people that have come to expect" funding. "Some people have been told it's not going to happen and more will hear that going forward," Boateng said. Being able to measure the effect of its grants will help the corporation transform itself into a "community trust" that will attract grant money and continue its mission to improve West Harlem when the checks from Columbia stop arriving in 2024. "The problems in this community are not going to go away in 10 years," said Boateng, who discussed the strategy shift with the attorney general's office. "Instead of saying, 'Here is money, do how you see fit,' we'll say, 'Here is the problem. Let's sit at the table together to solve it,'" Boateng added. The change comes even as the once-troubled group says it is pleased with the results of its first year of grants in spite of a lower-than-projected number of people directly impacted by the funding. The WHDC projected that 3,381 people should be directly impacted by the grants it gave out last year. But only 2,186 people were directly impacted. Boateng said 89 percent of the grant recipients from the first cycle were rated as satisfactory. "Nobody spectacularly failed," he said. More people than anticipated were indirectly impacted by groups that did things such as hold a concert for the general public. The groups were able to leverage the $2 million in funding that was awarded to win $4.4 million in other matching grants, according to the WHDC. Columbia has paid $9.8 million of the $76 million in cash it promised. The WHDC has $3.8 million on hand and plans to start reserving $1.5 million per year for investment. David Marion, associate director for The Reading Team, a nonprofit that works with children to boost early childhood literacy, said he's not surprised by the shift. 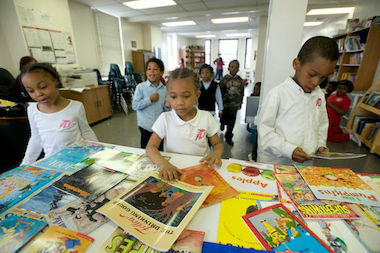 His group received $40,000 from the WHDC last year and launched a reading program at P.S. 36 in West Harlem, where just 8.5 percent of kids at the school met or exceeded proficiency on state English tests. The Reading Team helped increase by an average of 55 percentile points scores on the Test For Early Reading among pre-kindergartners and first-graders and expects to see a big jump in test scores in the next two years. Boateng praised the group as one that used its grant wisely and was able to produce measurable results in a targeted area that would draw the interest of other grant-making organizations. "Our take is that they are fine-tuning their vision, which has always been to transform West Harlem," said Marion. "Our model is working and with the help of the West Harlem Development Corporation we will be able to get into more schools and raise literacy in West Harlem."